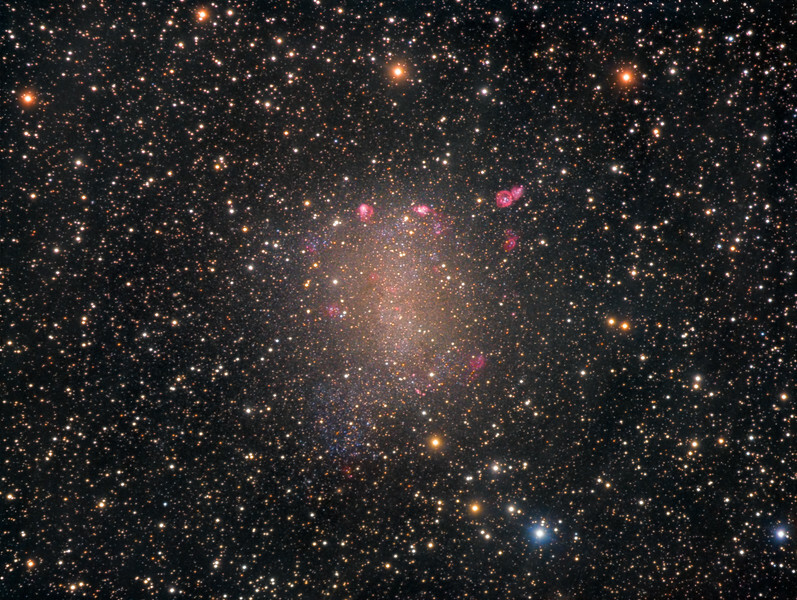 This image shows a deep view of Barnard's Galaxy (NGC 6822), an irregular dwarf galaxy that is one of the nearest neighbours to our Milky Way. This galaxy was discovered by astronomer Edward E. Barnard in 1884 and is located about 1.6 million light years away in the constellation Sagittarius. Despite boasting a meagre 10 million stars, and extending only one tenth the size of our Milky Way, NGC 6822 contains a full menagerie of hot red star forming HII regions, planetary nebulae, bright OB associations and dark clouds. In 1925 the famous astronomer Edwin Hubble published his paper 'N.G.C. 6822, A Remote Stellar System' which was a detailed survey of this galaxy. Apart from describing five of its brightest HII regions Hubble also discovered 11 Cehepid variables in NGC 6822. This was one of the most important discoveries in galactic astronomy and enabled NGC 6822 to be the first galaxy beyond the Magellanic Clouds to have its distance measured and in turn greatly expanded the size of the known Universe at the time. NGC 6822 is a challenging galaxy to photograph since it has a very low surface brightness. But still many of its brightest stars are resolved together with the various star forming regions and blue OB associations. Also visible throughout this image is a thin veil of wispy filaments, similar to high altitude fair weather clouds. These ghostly structures are now known as galactic cirrus, or Integrated Flux Nebula (IFN). Only a few decades ago such structures were often removed in image processing, as they were thought to be instrument artifacts or similar image defects. However, these ultra faint patches of nebulousity are real and consist of thin traces of gas and dust which is not directly illuminated by stars but merely reflect the extremely faint combined glow of the Milky Way.